Two Side Personalized Professional Hanging Sign - - 12" x 16" natural slate facility identification sign for businesses and professional offices. Custom made for you. The design, color, and personalized wording is the same on both sides. 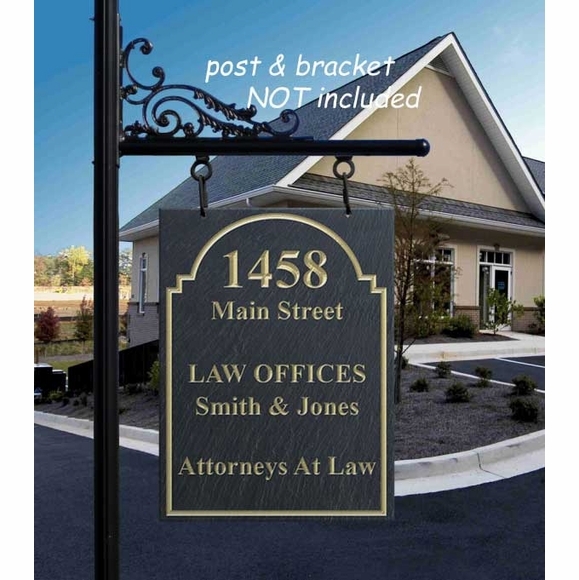 Sign contains five lines of custom text and either a professional logo for medical, accounting, dental, or legal offices; or a decorative border. This sign is designed to hang from a bracket (your own or the optional Stone Mill wrought iron bracket shown in Related Products). Improve visibility with professional signage that your customers, clients, and prospects can see from two directions. Five design choices: medical logo, accounting logo, dental logo, legal logo, or decorative arch shape border without a logo (option 5 in Select style dropdown box). Arch shape border shown in large image. Signs with each logo are shown in small images. with logo holds up to 12 characters approximately 2" high. with decorative arch shape border holds up to 5 characters approximately 2.5" high. with logo holds up to 5 characters approximately 2.5" high. with decorative arch shape border holds up to 15 characters 1.5-2" high. with logo holds up to 15 characters 1" high. with decorative arch shape border holds up to 12 characters 1.25" high. The hanging address sign also comes in a version with one side (see Related Products). Beautifully done! Arrived in plenty of time!